Today we had a short cruise of 30 mins until we arrived at the marina. It was straight onto the service pontoon to replenish supplies of diesel and coal, before we moored on our home berth. We will be staying here till Wednesday, to allow us to return to Kent for a birthday party, and to visit family before commencing our voyage to Chester. On Monday I will be conducting our first engine service, so I am hoping I can still remember what I was taught on the engine course. 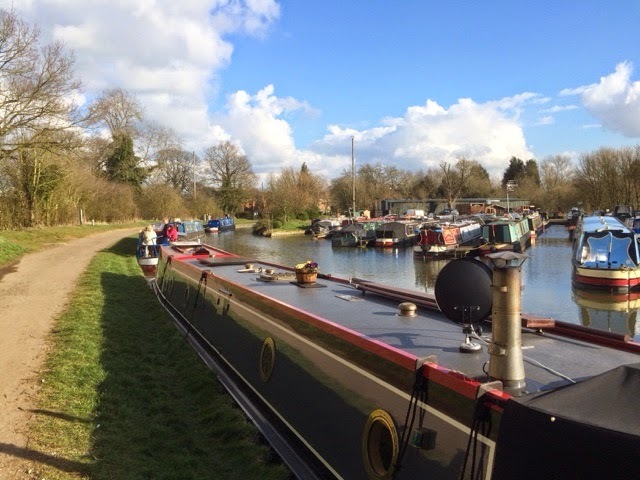 Departed Welford this morning with intermittent sun and clouds. The only lock of the day was set against us, but we quickly descended through that and arrived at the junction. This time we turned left, heading towards Norton Junction some 15 miles away. We however, were going to stop before that. The fine weather seems to have brought more boats out of their winter berths, as we passed quite a few today. We met the Canal and River Trust dredging teams near the winding hole at bridge 28, but passed them without delay. They appear to be repairing the bank using metal piling. We continued on a couple of miles more, just prior to bridge 22 where we are stopping for a couple of days. The towpath is wide and grassy, and is South facing so we have sun on us if it pops out, and a clear view of the sky for the satellite dish. We will stay here til Friday, when we are due to return to Yelvertoft Marina for the weekend. Just after settling down with our lunch we heard a loud toot toot. Looking out of the portholes we waved as our neighbours from the marina passed by on their Hudson boat 'At Last'. Yesterday we set off at 0750 for the bottom of Foxton Locks. 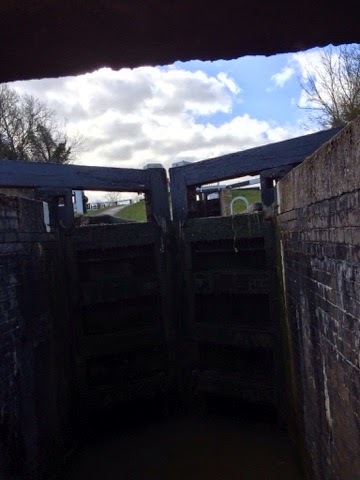 Having checked in with the on duty lock keeper, we were given the first slot for ascending the flight. There were 3 boats descending at the same time, so we were held in the centre pound to allow them to pass before continuing. The whole flight took an hour and ten minutes, including the enforced wait. It was however a good opportunity for a cuppa and a few photos. The two crew watching the boats forcing the skipper to make his own tea. 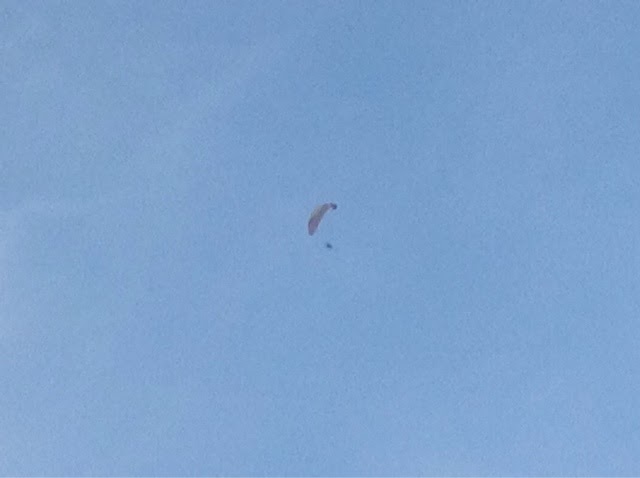 A motorised hang-glider with a birdseye view of the proceedings. 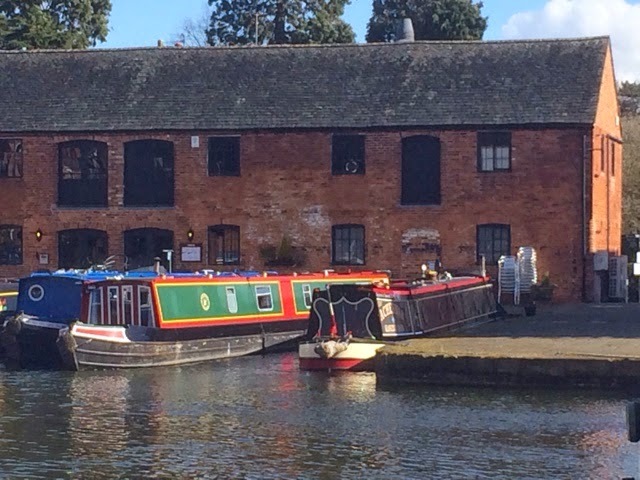 On arrival at Welford we moored opposite the small Marina, at the end of the arm close to the Wharf Inn PH. Today we took a 4 mile walk along the towpath, ending up back at the Wharf Inn for lunch. On return to the boat a quick check of the weather tomorrow confirms we should be ok to move off, back to Yelvertoft in the morning. We plan to stop a couple of bridges before the marina, so then we only have a short distance to go on Friday morning. 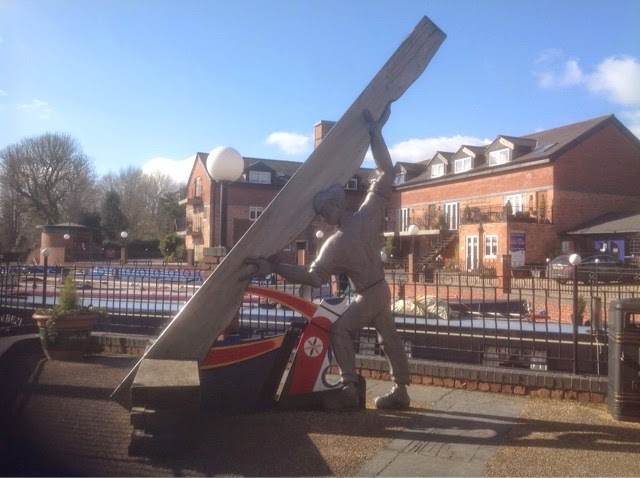 As planned, lunch today was taken at the Foxton Locks Inn where they do a splendid carvery. This was followed in my case by lemon meringue pie which I can recommend. 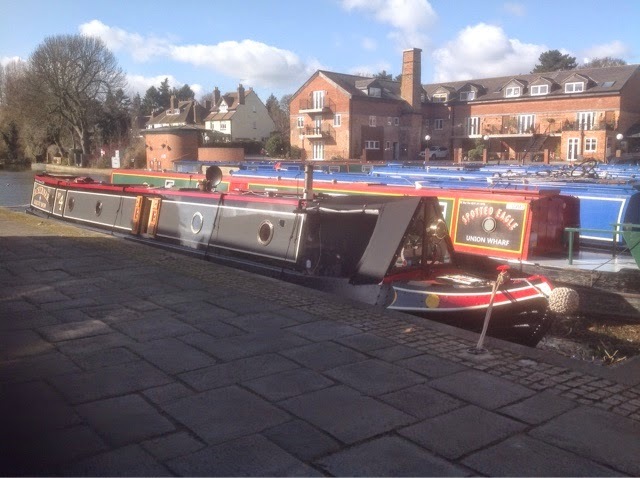 We then took a circular walk back to the boat to enjoy the afternoon sunshine. 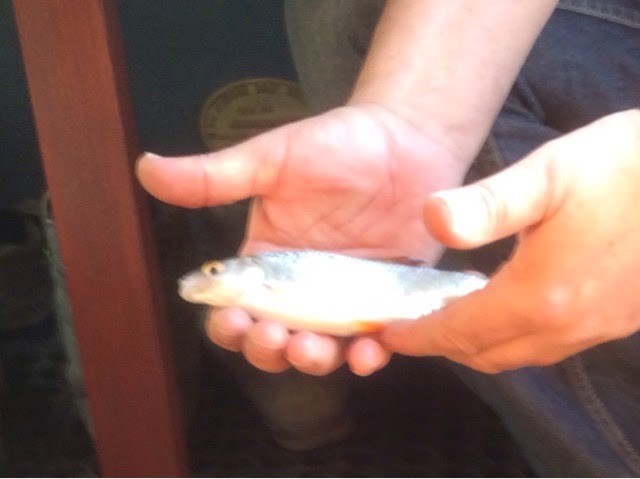 Later I took to fishing and caught a monster sized fish. It fought hard to remain free. Well it looked bigger before it was landed. I think it is a roach but if anyone who reads this knows different then please let me know. With the sun shining all day today the solar panel produced a total of 56 amp hours which is about a third of our daily consumption. This has meant not having to run the engine for 3 days now and as the summer arrives even more free electricity should be produced. Tomorrow we head for Welford so an early start is planned. The locks open at 8am so it would be nice to be on our way by then. Woke early this morning, due to the astronomical event that was due to take place today. Amazingly the weather reports were accurate for our position in the country, and we had perfect conditions for viewing the partial eclipse. 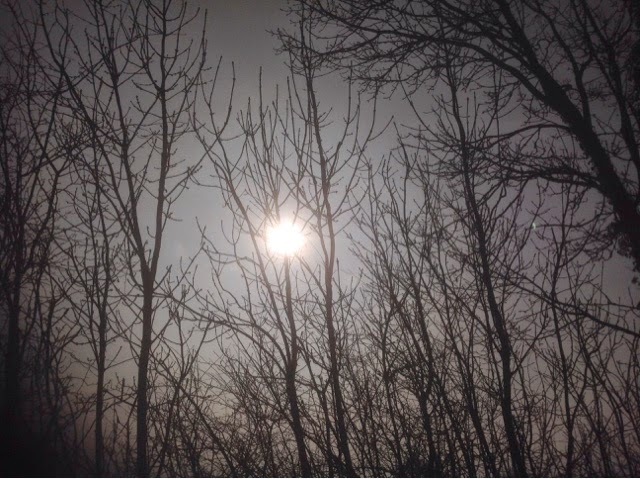 Based in Leicestershire, we were expecting 85 to 90 percent of the sun to be blocked by the moon. Having said that, it still meant 10 to 15 percent of the sun would be shining and so I was not expecting for it to go particularly dark. I only had the iPad camera to play with, and no special solar filters the photos taken only acheived limited success. 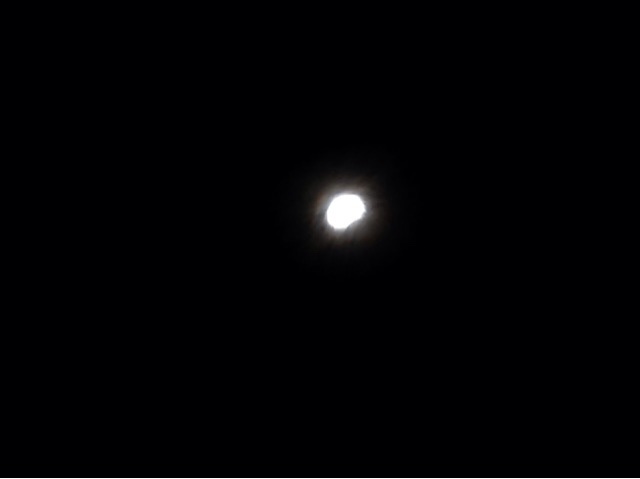 Photo taken at about 0935, the supposed peak of the eclipse. Not exactly dark but it was a strange light. The only photo showing part of the Suns disc missing. Without solar filters, even adjusting the exposure settings, the power of the Suns light was too much to get a decent picture. Our walk today took us across the fields to the Black Horse at Foxton where we enjoyed lunch in their garden in the sun. Having been alone for a week we now have some neighbours. We are still planning on departing on Monday subject to the weather. 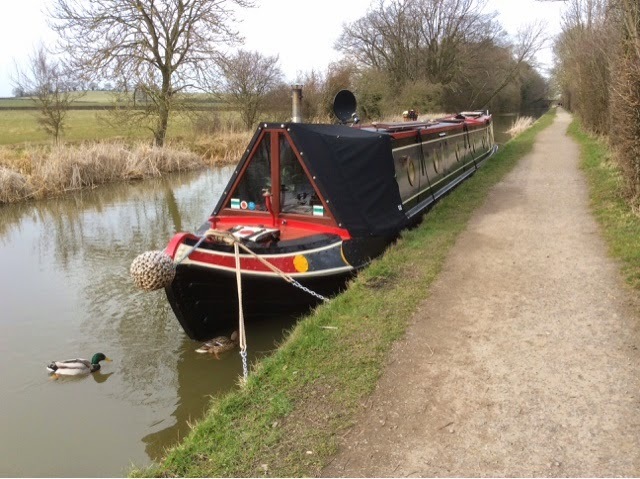 We have been at our mooring now for six days and it is a nice peaceful spot. When the sun is shining it is on the solar panel all day, which is good for the batteries. We are now able to run all our electrical needs for two to three days without having to charge them using the engine. Today we needed to take on water and to pump out the holding tank. We were also out of coal for the stove. We set off at 8.30 in the mist, for the water point 300 yards ahead of us. It was slow filling due to low pressure so it was nearly an hour before we were done. In this time the mist had lifted, and we had clear blue sky and bright sunshine. A number of anglers had passed us, heading for the stretch of water we had just left. During a conversation with them I told them our plan was to return to our previous spot. They were happy to leave it free for us which was great. We set off for the junction, as we had to now head back to Debdale Wharf for the pump out and coal. Whilst there we met the owners of Black Bart who had just had the same zinc coating done that we are having in October. What was really spooky was they are from Kent like us, they moor at Yelvertoft like us and have been living on board since July like us, it's a small world. On return to our spot we secured the boat, then walked across the fields to the village of Gumley. We found the Bell Inn and popped in for lunch. It was gone 3pm before we were back at the boat, to relax after our strenuous days work. We are now set up to stay here till Monday or Tuesday, so a Sunday roast at the Foxton Locks Inn is on the cards. 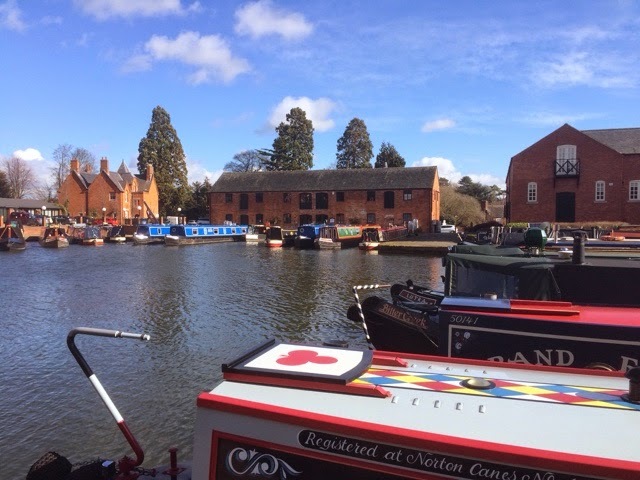 Today we set off from Union Wharf in Market Harborough in bright sunshine. It was 1030 as we reversed from our mooring being watched by our temporary neighbours who were enjoying their daily coffee morning. If ever there is a time to make an error it is when being watched by a group of experts. 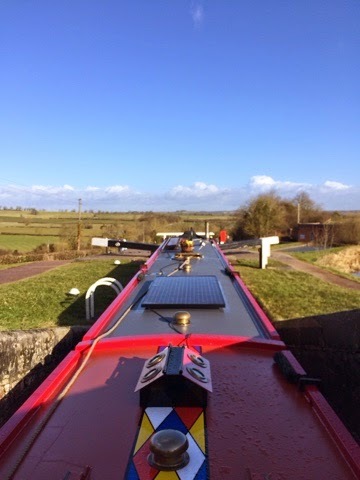 Fortunately we turned in the basin without incident and set off along the arm towards Foxton and the famous flight of locks. At the junction we turned right heading towards Debdale and Leicester. We are having some work done at Debdale Wharf later in the year so this was an opportunity to see its position on the canal. We winded (turned) just prior to the wharf and found a nice spot to moor prior to the Foxton mooring zone. It is a good rural position, close enough to the pubs for lunch but far enough away to be quite. We will probably stay here for a few days, or may stretch it to a week. 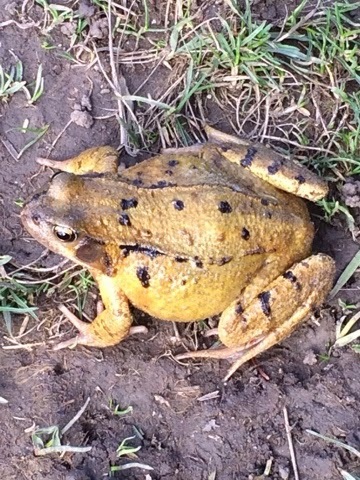 You can tell spring is here as this cheeky chappy made an appearance on the towpath. Just some information and pictures of our temporary home. 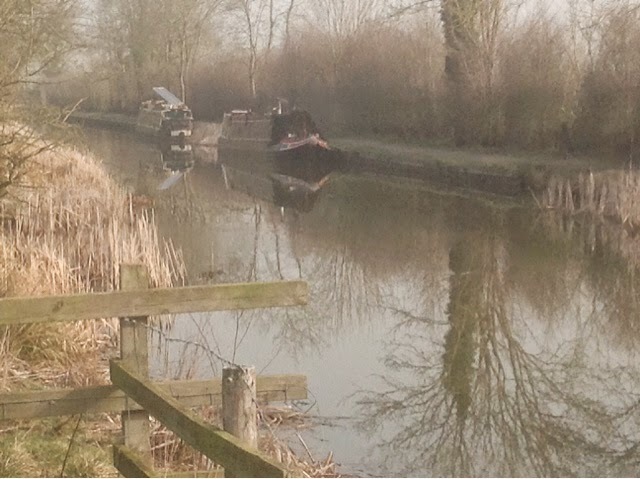 On Saturday we broke free from our winter mooring at Yelvertoft Marina and headed for Welford junction. 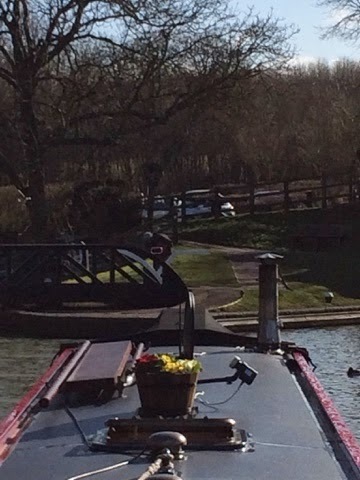 We moored on the rings overnight and set off Sunday morning for Foxton. On both days the weather was quite windy and very cold. 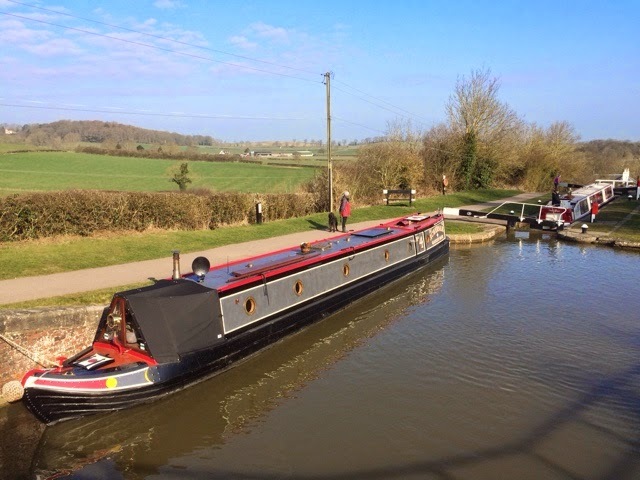 On arrival at Foxton we moored above the top lock and then walked down to the Foxton Locks Inn for Sunday lunch. We all opted for the carvery which was very tasty. After lunch during the walk back to the boat the rain came. We were tucked up inside with the stove going before it really poured. This morning we set off for the locks. As we moved off it began to snow. Fortunately it lasted all of a minute or two then stopped. As we descended the locks the sun came out and the views ahead were splendid. 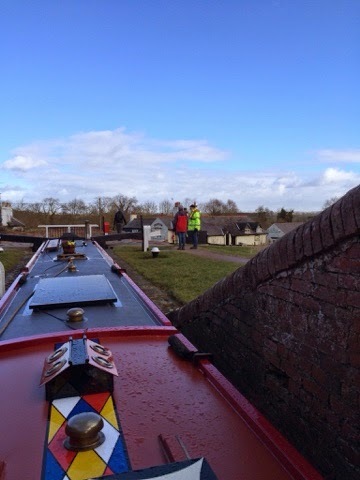 This was our first transit of Foxton Locks and all went smoothly helped by the on duty lockie. 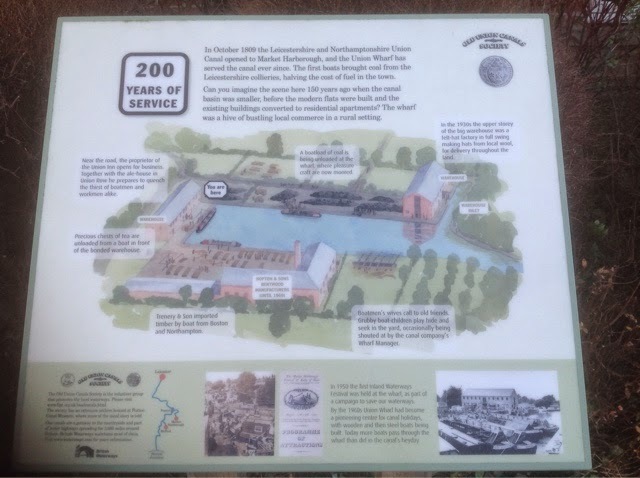 At the bottom we turned right onto the Market Harborough Arm and travelled the five miles to Union Wharf Basin. On the way we passed some very large houses with even larger gardens. We are now moored against the wall in the basin to the front of the Waterfront Resturant. Having looked at the menu I am sure we will try it before we depart. We have friends visiting us on Wednesday and then a few other things to sort out so we will stay here til next week. As a final note, our dog Oscar has developed some bad habits over the winter. 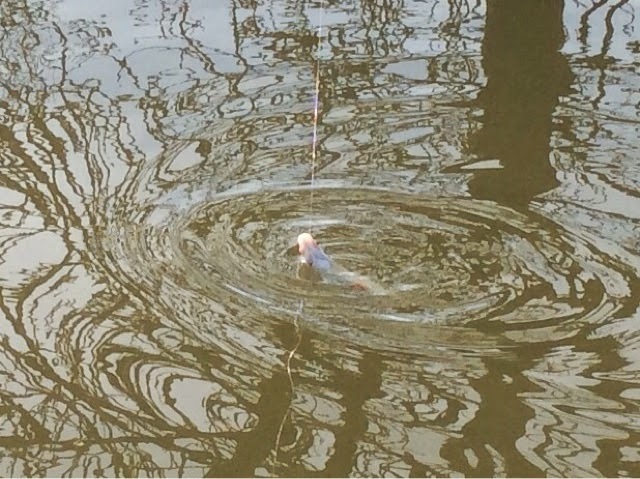 He has taken it upon himself to leap from the boat to the towpath as and when it pleases him. He does not know yet but he is going to be undergoing some re training over the next few days.